Dr. Sid Ahmadi received his Doctor of Dental Surgery (D.D.S) from Baylor College of Dentistry In Dallas Texas, where he also earned a certificate in Advanced Education in General Dentistry (A.E.G.D). Dr. Ahmadi graduated from Michigan State University as an Electrical Engineer. He worked over six years as a design engineer prior to becoming a dentist. He was completing his Master of Science degree in Electrical Engineering when his interest turned to dentistry. Dr. Ahmadi is a Diplomate in the International Congress of Oral Implantology (DICOI) which is one of the highest certificates and title in the ICOI and also a Fellow in the Academy of General Dentistry (FAGD). These awards are given to dentists who are dedicated to lifelong learning, professional development and continuing education. Both the "Diplomate and Fellowship" certificates require a rigorous written and oral exams and years of continuing education. 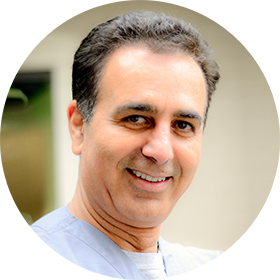 In addition Dr. Ahmadi has studied under Carl E. Misch, a renowned implantologist and prosthodontist where he has earned certificates in various surgery disciplines as well as prosthetics. It is the compilation of these experiences and skills both as a surgeon and a clinician who has earned him praises from his patients and recognition from his peers.